The narrative structure is unusual, and there really isn’t much action, because the story is far more focused on exploring the individual story arcs of the ensemble cast of characters. Ostensibly the story follows the crew aboard ‘The Wayfarer’, a spaceship that punches tunnels through space as though tunnelling through the rock in a mountain. 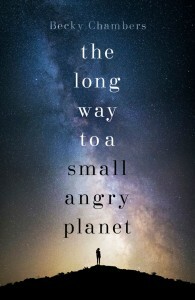 The ‘small angry planet’ they are travelling to doesn’t actually emerge as a destination until about halfway through, and there is no central conflict. It really is a story about a long, open ended, journey. The main reason I adored this quirky novel was that it is all about family. The family you have and the family you choose for yourself, and all the different places we call home. The crew members of The Wayfare, 4 humans, 3 aliens and a sentient AI, weave a web of friendship, romance, and as with all families, conflict. Exploring how all these different relationships grow and change was so wonderful. The final sentence “She was exactly where she was supposed to be” had me grinning like crazy and overflowing with warm-fuzzy feelings. I can see why this might not be for everyone, as the pace was rather slow, and Chambers has a tendency toward diverting into discussions about topics like what it is to be human (or sentient), or exploring how we build our cultural identities. There are long passages about the majesty of space, the intriguing draw of the unknown, and a clear joy in the descriptions of the weird and wonderful alien cultures Chambers has invented. I loved all of it. Those kinds of diversions really suited the slowly unfolding pace, and I found myself pausing to reflect on how deeply ‘human’ this novel was, despite the ‘alien’ setting. When I search for a negative, there is only one that jumps out at me. Sometimes it was hard to understand some character’s motivations for impulsive actions, or their reactions to the fallout, and I did sometimes wish to stay with some of the characters for longer, to really understand them. But on the other hand, watching the action unfold from an atypical perspective was a refreshing change of pace from the single or dual perspective novels I read more often. I loved this book. I really did. The sequel can’t come soon enough, because I miss the Wayfarer crew already and it has been mere hours since I left their company. It definitely won’t be for everyone though, because of the pace and the focus on relationships rather than action. It is suitable for ages 16 and up, as there is some strong language in places and reference to adult themes, but nothing particularly graphic. Highly recommended for fans of Firefly and Serenity, if you miss that awesome crew like I do, then The Wayfarer might just help fill that hole in your heart. Yay for no love triangle!